No estimate needed. No tricky hidden fees ever. A flat rate all the way through the roof. You haven't cleaned your dryer vent since 1980's? That's our special, price is $100. Your dryer vents out way up on the side of your house? Yes, price is $100. Your dryer vents out on your roof (up to 2 story)? Yes, price is $100. Your dryer vent is completely clogged? Yes, price is $100. Your dryer vent is 50 feet long? Yes, price is $100. All this with a 30-Day Money Back Guarantee! REMEMBER, THIS IS CASH PRICE ONLY! with your desired day and time and Angel will take care of you. HOW DOES ANGEL GET ALL THE LINT OUT? Angel does thorough dryer vent cleaning using the latest professional and safest technology available. Typically before Angel starts the cleaning process, he gets a reading from his anemometer to get a gauge of the air flow. 2. Using Jet-Snake air compressor. Angel cleans dryer vents from the outside of your house using a high pressure, compressed air tool called a jet-snake. The jet-snake shoots down the vent like a rocket, blasting loose lint and debris, sending it to the outside. 3. Cleaning the dryer machine itself. After cleaning the dryer vent from the outside Angel will need to enter your residence and access your dryer machine. He will clean the lint filter and any lint build up found inside your dryer. At the end of the cleaning process, Angel will test the entire system and get a reading from his anemometer to get a gauge of the increased air flow. 5. Your clothes dry faster. Yes, a responsible adult must be present during your dryer vent cleaning. The owner of ANGELINDY, Angel Todorov. ​We do NOT hire teenage or day-laborer "experienced technicians" paid around $10-$12 per hour. do you clean dryer vents during winter? Yes, all year round. 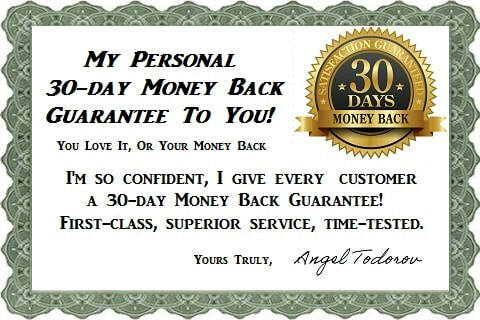 Upfront flat rate along with a 30-day money back guarantee! Angel cleans dryer vents from the outside of your house using a high pressure, compressed air tool called a jet-snake. The jet-snake shoots down the vent like a rocket, blasting loose lint, debris, and nests, sending it to the outside. However, upon very stubborn blockage we would use brushes and even leave blower in order to fully unclog your dryer vent. Absolutely. If you are not completely satisfied after Angel has cleaned your dryer vent, please contact him within 30 days and he will refund all your money in full. No questions asked! In case your house is outside of our serving area, a $25 trip fee applies. what if my dryer isn't working? No worries. In such case Angel still can clean your dryer vent. Before starting the work, he will unhook your dryer and in order to prevent any dust entering your home he will tape the dryer vent opening. Then he will start with the cleaning process. After he is done, he will remove the tape and hook up your dryer again to the dryer vent. As always guaranteed absolutely no mess. In order to keep our dryer vent cleaning rate low we accept cool cash only in person. Rest assured, a receipt will be emailed or texted to you accordingly. Thank you for your support and understanding! hOW OFTEN I SHOULD CLEAN MY DRYER VENT? Once per year is best. Once per 10 years is calling the fire.